Citation: C N Trueman "Henry VII and Ordinary Revenue"
For Henry VII, ordinary revenue consisted of income from crown lands, custom duties, feudal dues and profits of justice. Ordinary revenue was collected annually and was seen as a king’s right. Henry VII particularly targeted revenue from crown lands as if the income from them was maximised, it represented a considerable percentage of Henry’s annual income. In the past, money had been collected from crown land but not all of it ever reached the king’s treasury. There is little doubt that corruption accounted for some of this but money was also lost to a king as a result of simple incompetence. Henry modernised the way crown lands were administered and he also ensured that he himself kept as much of these lands as was possible. In the past, large areas of crown land had been given away usually in the form of a reward for a loyal noble. In 1485, Henry had control over all the land owned by the York and Lancaster families, the Principality of Wales, the Duchy of Lancaster and the earldoms of Richmond, March and Warwick. Henry gained more land as a result of escheats – when men died and left no heirs, their land passed to the king. Acts of attainder also led to the king gaining land. The most serious consequence of an act of attainder was execution. However, another common punishment was to have your estate confiscated and handed to the king. 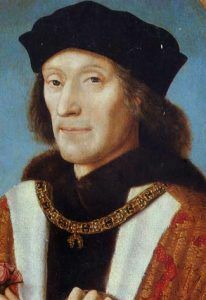 Henry VII knew that ownership of land would bring him wealth. This, in turn, would allow the king to build up his army and make him a more formidable opponent. In 1486, Henry persuaded Parliament to pass the Act of Resumption, which recovered for the Crown all the property granted away since 1455. Though Henry got some of the land back, he did not get it all. The reform in the administration of the Duchy of Lancaster set the standards for other royal property. In 1485, the Duchy brought in just £650 to the Chamber. However, after its modernisation, such as the adoption of new methods of estate management, this had increased to £6500. Managers were urged to gain as much as they could from the land they managed. Henry personally went through the accounts. The same methods were used in all crown lands. This was so successful that in 1509 the king received £42,000 from his lands – a considerable increase on the £29,000 he received in 1485. Henry VIII was to benefit from this. Henry VII did not hand out crown land as a reward for good service. Rather he ensured that he consolidated what he had and exploited it to the full. The death of Prince Arthur in 1502 meant that all crown land would pass to Henry VIII on the death of Henry VII. Therefore, it remained a solid block rather than be divided between both sons. In 1485, the largest chunk of Henry’s income came from custom dues. Though crown lands overtook custom dues in terms of the amount raised, custom dues still accounted for a third of the king’s income by 1509. The duties levied on wool, leather, cloth and wine were the most valuable for Henry. The king built on the work done by Edward IV who had modernised the administration of the system to stamp out embezzlement. Twice during his reign he updated the Book of Rates of custom duties to be paid in London. Between 1485 and 1495, custom dues earned Henry about £33,000 a year. From 1495 to 1509, this increased to £40,000 a year. Probably the greatest obstacle Henry faced regarding custom dues was something he had little control over mainly because it was so difficult to police – smuggling. Henry also received money from feudal dues. As the title suggests, these were sources of income that came from an earlier era but were still in place in Henry’s reign. Henry as king was the greatest feudal lord. Those who held land directly from the king were his tenants-in-chief. They owed their feudal lord certain dues. One of these was wardship – whereby the king took control of land when a minor inherited it and oversaw it until that minor came of age. During this time, the king took most of the profits made from that land. Occasionally, the time difference between coming of age might have been just a few years; however, it was feasible for the time to be a lot greater than this and, therefore, a wardship could be lucrative. The king’s feudal dues extended to marriage when the king could give unmarried heirs and heiresses in marriage but at a profit for himself. A king was also entitled to ‘relief’ – money he received when inherited land was transferred. Despite feudal dues being somewhat out-of-date for Tudor England, Henry was determined to enforce what he believed to be his. In 1487, wardships provided Henry with just £350. By 1507, with a Master of the King’s Wards in place to enforce it, wardships were earning Henry £6,000 a year. The judicial system gave Henry another avenue for revenue collection. As head of the legal system, Henry was entitled to some of the money made by the judiciary. This money came from two sources: any legal action had to start with a writ and this had to be paid for and many cases ended with a fine being paid. Either way, Henry was entitled to some of this money. The latter, the fines, earned the king a handsome sum of money and the rumour spread in his lifetime that Henry deliberately charged nobles with a technical offence knowing that they would be fined and that he, as king, would be entitled to some of this. However, the evidence does not support this and the rumour was almost certainly spread by his enemies. What Henry did do was to invariably enforce a fine as opposed to any other punishment. Even treason for the guilty party could end in a fine as opposed to the usual execution. In 1497, the people of Cornwall rebelled. The leaders were executed but the followers were simply fined. Henry also allowed people to pay for a pardon rather than be punished in a more draconian manner. The Earl of Northumberland paid a massive £10,000 for a pardon for misconduct – assaulting a royal ward. In 1495, Sir William Stanley was found guilty of treason by attainder. Rather than have him executed, Henry allowed for a pardon to be paid of £9,000 as a lump sum and £1000 a year after this. It is hardly surprising that the Parliaments of Henry passed many acts of attainder peaking at 51 in the lifetime of one Parliament. Therefore, ordinary revenues were a vital financial lifeline for Henry VII and his reforms of the sources of this income did a great deal to give him financial stability. He also had an income from extraordinary revenue.